ive touted Auburn a lot last year and this year, and they are an exciting team, i was saying last year to keep an eye on them as those freshman all grew up together, and why wait for them to play a team they should beat, ill bet on them when they are favored in a game where i thought they would be a pick'em at best, one worry for me is the boards, can they control the boards?? out , fla st is killing murray st by getting so many shots ..
so trying to win 150 to be out just a little we'll see ..
Last edited by ONE51RUM; 03-23-2019 at 10:26 PM. Last edited by ONE51RUM; 03-23-2019 at 10:36 PM. Last edited by ONE51RUM; 03-24-2019 at 08:23 PM. Last edited by ONE51RUM; 03-24-2019 at 09:01 PM. Last edited by ONE51RUM; 03-24-2019 at 10:14 PM. Mike started building quantitative sports power ratings in 1997 at the tender age of 19. 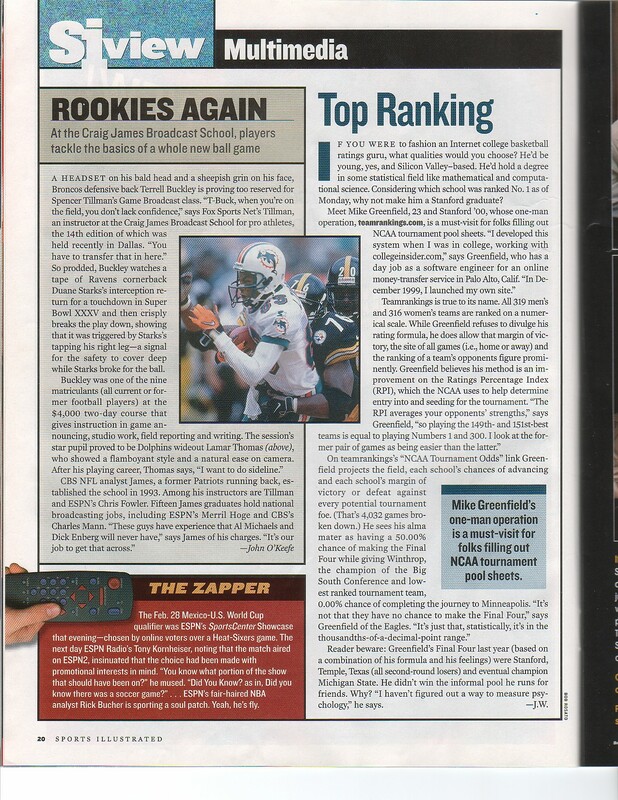 After teaching himself enough about computer programming to build a basic web site, he launched the original TeamRankings.com from his Stanford dorm room in 2000. The site set a new standard in incredibly slick web design. Back when the term "Moneyball" was still just a twinkle in Michael Lewis' eye, Mike’s objective ratings and analysis quickly achieved national prominence, especially in college basketball. In March 2001, Sports Illustrated profiled Mike in a feature on March Madness bracket picking. After a numbers-obsessed youth in which he memorized 36 significant digits of Pi, Mike broke West from Philadelphia to earn a BS degree in Mathematical and Computational Science from Stanford. In his career outside of TeamRankings, he has played key analytical roles at PayPal and LinkedIn, co-founded two VC-funded startups, and served as Growth Hacker-In-Residence at business accelerator 500Startups. Today, Mike primarily advises TR in the areas of analytics and strategy, but occasionally still gets his hands dirty with analytical or coding work, especially if it involves the NCAA tournament. Despite clearly being wrong, he also insists you call the third-to-last round the "Crazy Eight." Please win this one! Good luck 151! Last edited by ONE51RUM; 03-25-2019 at 05:58 PM. Damn, another rough night.... Get it back tomorrow dude.